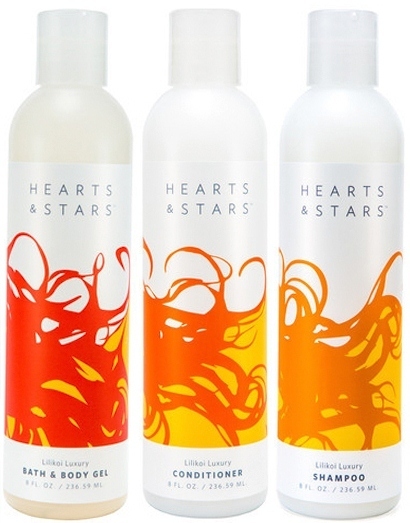 Hawaii-based stylist Jason Harsin, owner of Hearts & Stars Salon & Day Spa in Waikaloa Village on the Big Island, was having trouble finding shampoo and conditioner that worked on different hair types, so in true entrepreneurial fashion, he created his own. Keeping us mermaids and mermen in mind, Harsin created products that would deliver serious amounts of protein to our hair since it gets stripped in the sun, sand and surf. He then added eucalyptus and sage to leave locks feeling so fresh and so clean, and tea tree oil, for a tingling effect on the scalp. For us frizzy-haired gals (hey friends! ), he delivers an anti-humidity hairspray and a smooth and shine serum. One whiff of the lilikoi items and you're reminded that we sure do live in paradise (and if you're not lucky enough to call Hawaii home, you can at least be transported there for a brief moment). Below, what you can expect to find in these natural products. What you won't find is paraben wax and sulfates, found in many commercial products, which cause build-up and are linked to cancer. No thanks. Hemp, sunflower and avocado oils add nutrients and repair damaged hair. Grape seed extract, rosemary, sage, grapefruit and biotin promote hair growth. Geranium, lime, burdock and mint improve scalp circulation and health (and potentially help with dandruff!). Comfrey, chamomile and Vitamin B5 makes hair thicker and shinier. Aloe vera moisturizes dry, flaky skin. Grapeseed extract events out skin tone and fights wrinkles with antioxidants. Lemongrass calms and revitalizes skin, while cleansing oily skin. Witch Hazel evens skin tone and promotes healing. And in the spirit of aloha, a portion of the proceeds for every bottle sold Hearts & Stars goes to a local Big Island food bank, The Food Basket. So I definitely suggest booking your appointment at the salon or getting your hands on these prettifying products. They're available online, at select salons, on Oahu at Red Pineapple in Ward Center and on Molokai at the Hotel Molokai's Local Store.